On a misty morning in May 1915 the Cunard liner Lusitania passed eastwards off Baltimore on course to her fateful encounter with the submarine U-20 which was to shape the course of World War I. The Lusitania is the most famous shipwreck off West Cork, but she is far from the only one. The rugged coastline around Baltimore has been the scene of many wrecks — vessels ranging from small sailing craft to a huge modern bulk carrier. One such loss is commemorated in the name of the Loo Rock at the harbour’s mouth, which claimed the British man-of-war HMS Looe in 1697 (the final ‘e’ was a further casualty at some point). A highly significant wreck occurred in November 1847 when the American sailing ship Stephen Whitney on passage from New York to Liverpool struck the head of the western Calf Island, after the crew had mistaken Crookhaven lighthouse for the Old Head of Kinsale. Of the many passengers on board few survived. Those that did found themselves cast up in darkness on a lonely shore where the Great Famine was at its height. This shipwreck led eventually to the construction of the first lighthouse on the Fastnet Rock. By far the greatest number of sinkings in the waters off Baltimore occurred during the two world wars. They included cargo ships, passenger liners, warships and U-boats — the hunters and the hunted. Just south of the harbour lies the wreck of the 5,670 ton Malmanger, sunk by U-43 in 1917 barely a month after her completion. The Norwegian tanker settled with her bow on the sea bed and stern high in the air for long enough for people to row round her from Baltimore and take photographs. Two warships that also appear in the photographs, Alyssum and Mignonette, were both sunk within the week, a measure of the intensity of naval warfare in the area. The largest wreck off Baltimore (and one of the largest in the world) came to grief more recently. 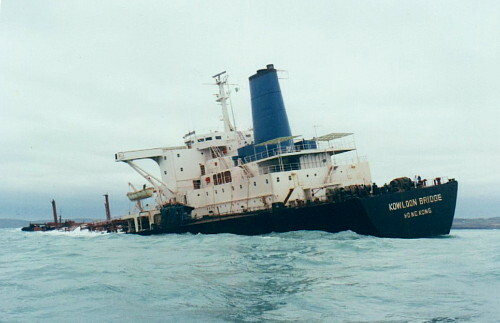 The crippled ore-carrier Kowloon Bridge was abandoned by her crew in the hope that she would steer herself out to sea. Instead the unmanned 294 m (965 ft) long vessel turned shorewards, passing perilously close to Baltimore itself, and struck the Stags rocks on 24th November 1986. The ship soon broke her back and tugs were unable to dislodge her. Over the ensuing weeks she sank gradually by the stern, though her bow was still visible above water months after the disaster. Though out of sight, the many shipwrecks off Baltimore are far from forgotten. Today wrecks like the Kowloon Bridge and the U-260, a World War II submarine, are popular dive sites, while the countless wrecks in deeper water are prolific marks for sea angling.